By Chris Williams: WBA/WBC welterweight champion Floyd Mayweather Jr (47-0, 26 KOs) doesn’t know who he’ll be facing next in his fight in early 2015, but he does know he’s not going to be pressured into fighting guys that have already been exposed by other fighters such as Amir Khan and Manny Pacquiao. Mayweather thinks Pacquiao hasn’t been the same fighter since his strength and conditioning coach Alex Ariza was shown the door by trainer Freddie Roach. Mayweather notes that Pacquiao hasn’t scored a knockout since Ariza left. Pacquiao has fought 8 times since the last time he scored a knockout against Miguel Cotto in 2009. The streak will likely continue into his next fight against Chris Algieri on November 22nd, because this is a guy that rarely engages, and he’s not easy to hit clean. Mayweather went onto say that Pacquiao still needs to fight Juan Manuel Marquez again because he still hasn’t finished the business with him. 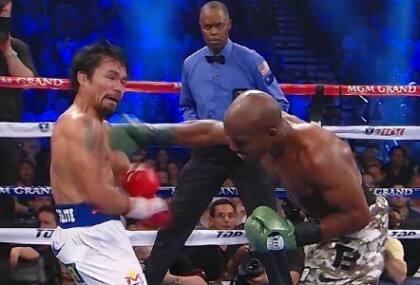 Marquez knocked Pacquiao out a couple of years ago, and that’s a fight that Pacquiao still needs to avenge. It’s one that can definitely be put together if Pacquiao and his promoter Bob Arum give Marquez enough money. Believe me, I think Marquez would jump at the chance of fighting Pacquiao for a fifth time if they gave him a 50-50 deal. Ariza did a great job with developing Pacquiao’s power, and I’m really surprised that they let him get away because he definitely was a good addition to Pacquiao’s team. Of all the guys on Pacquiao’s team, Ariza would be the last guy I would let go if he was my strength and conditioning coach. Guys like Roach can go and Pacquiao would still have success with other trainers, but Ariza was a lot more valuable because he does a good job. Brandon Rios and Marcos Maidana haven’t looked the same since they stopped working with Ariza.